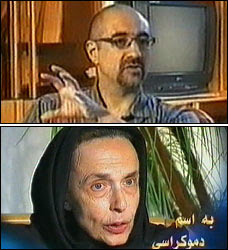 Iran's state-run TV has announced that it will broadcast Stalinist-style "confessions" by two imprisoned Iranian-Americans intellectuals charged with espionage, promoting democracy, and other alleged crimes: Haleh Esfandiari, Director of the Middle East Center at the Woodrow Wilson Center, and Kian Tajbakhsh, a New York-based social scientist associated with George Soros's Open Society Institute. Iranian television aired images of two imprisoned Americans yesterday for the first time and said it will show more video tomorrow that includes confessions by scholar Haleh Esfandiari of Potomac and New York-based social scientist Kian Tajbakhsh. The clips included apparent excerpts from the larger TV effort, titled "In the Name of Democracy," in which both make statements about their activities. Tehran maintains their work is designed to undermine Iran's security and foment nonviolent revolution. Esfandiari, the director of Middle East programs at the Smithsonian's Woodrow Wilson International Center for Scholars, is quoted as saying her work was "in the name of dialogue, in the name of women's rights, in the name of democracy." The 67-year-old grandmother was pictured wearing a black head scarf and a coat in a setting outside Evin Prison's Ward 209, where she has been held in solitary confinement since she was detained May 8. The trailer to the footage charged that Esfandiari was an agent for the 2003 "velvet revolution" in Georgia, which led to the resignation of President Eduard Shevardnadze. Tajbakhsh, a consultant for George Soros's Open Society Institute who was arrested May 11, was quoted as saying that the role of "the Soros center after the collapse of communism was to focus on the Islamic world." He was pictured holding notes. Esfandiari and Tajbakhsh hold dual U.S. and Iranian citizenship. Shaul Bakhash, Esfandiari's husband, charged that the Iranian government had resorted to televised fabricated "confessions," KGB-style. "Haleh is shown saying she brought speakers and Iranian academics to the Wilson Center. Only a paranoid would suggest this amounts to criminal activity," he said in an interview. The implication that Esfandiari was associated with Georgia's political upheaval is "ridiculous," because she has never been to Georgia or engaged in any way with the country, said Bakhash, a professor at George Mason University. For some further background, see here & here & here & here. The Woodrow Wilson Center has issued a pre-emptive response to Esfandiari's televised pseudo-confession (see below). WASHINGTON — The Woodrow Wilson Center announced today that any “confessions” by Haleh Esfandiari which Iranian state-run television says it will air on Wednesday and Thursday have no legitimacy. Esfandiari, director of the Wilson Center’s Middle East Program, has been held in Tehran’s notorious Evin prison since May 8th on charges of acting against Iran’s national security. Haleh is in her 71st day of solitary confinement in Evin Prison. She has seen no one from outside the prison during this time: not her mother, not her family, not her lawyer, and not the ICRC or any independent international body. Any statements she may make without having had access to her lawyer would be coerced and have no legitimacy or standing,” said Lee H. Hamilton, president and director of the Woodrow Wilson International Center for Scholars. "This reprehensible pattern of activity by interrogators in Iran has occurred before: jailing innocent people, confining them, and then producing a framed or cobbled statement or confession. This is not a fair judicial process at work." "The reported charges against Haleh are ludicrous," said Hamilton. "Haleh is a scholar who has tried only to promote dialogue and understanding between the U.S. and the Middle East region, to include Iran . We are extremely concerned about Haleh and her mental and physical well-being. I again ask the Iranian government to end this ordeal and stop making totally false allegations against Haleh. Let Haleh and the other detained Iranian-Americans return safely to their families." For up-to-date information regarding the situation of Dr. Haleh Esfandiari, please visit the Wilson Center’s media update center at www.wilsoncenter.org/halehnews. To get involved in the campaign to free Haleh, go to www.freehaleh.org. Media with questions may reach Sharon McCarter at (202) 691-4016 or sharon.mccarter@wilsoncenter.org.